"The end always comes faster than you think." Once there were hundreds of members of the Oversight, the brave souls who guard the borders between the mundane and the magic. Now there are only five. And their numbers are dwindling further still. When a vagabond brings a screaming girl to the Oversight's London headquarters, she might answer their hopes for a new recruit, or she could be the instrument of their downfall. 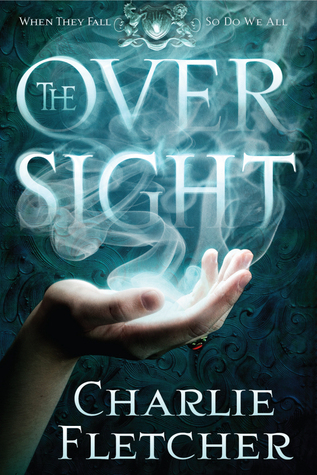 In his first novel for adults, Charlie Fletcher (The Stoneheart Trilogy) spins a tale of witch-hunters, supra-naturalists, mirror-walkers and magicians. Meet the Oversight, and remember: when they fall, so do we all. The Oversight is Charlie Fletcher’s first foray into adult fiction, but the control he has over his complex narrative is astonishing. Told from multiple perspectives, The Oversight is a complicated web of episodes that combine perfectly into a breathtaking and well-executed story. Admittedly, due to its complexity, the beginning might be a bit slower for some, but once the pieces start coming together, The Oversight becomes practically unputdownable. Set in a version of Victorian London in which the supranaturals secretly rule the foggy streets, The Oversight is deeply atmospheric and gorgeous. One can almost feel the humidity of those nights, smell the houses, shops and dark corners our heroes police. The Oversight, you see, is short for Free Company for the Regulation and Oversight of Recondite Exigency and Supranatural Lore, a group of supranaturals that watches the shadows and keeps other supranaturals in line. Once upon a time, the Oversight had numerous members, hundreds of people dedicated to keeping London safe. But the Oversight Fletcher introduces us to has gone through serious changes and disasters. With only five members, they can’t afford to lose anyone else. Five need to remain together to make a Hand, or the Oversight ceases to exist. When young Lucy Harker is brought to Sara Falk’s house, it’s clear from the start that she is supranaturally gifted. In her, Sara sees an opportunity to strengthen the Oversight, but she could very well be walking straight into an elaborate trap. Sara and the others are forced to decide whether taking Lucy in is worth the risk. As the Oversight battles various enemies, their own moral ambiguity is brought to light. Fletcher doesn’t deliver absolutes – the more of this story we read, the clearer it becomes that everything exist in a gray area and new questions and turns keep taking us by surprise. Overall, The Oversight is a pretty spectacular historical urban fantasy, not to be missed by fans of the genre, fans of atmospheric books, fans of Victorian London, or fans of great literature in general. Fortunately for me, it’s a trilogy. I have so much to look forward to. Stop by the blog tomorrow for my second ever Nocturnal Quote, chosen from this book. I'm usually fine with a slow beginning as long as I know the story is going to pick up at some point, so thanks for the heads-up on that Maja! This whole story sounds gorgeously written and I just love atmospheric books like this. So glad to know this was a winner for you! It sounds like any rough spots in this one are either quickly forgotten or just don't even matter as the story takes over. Wonderful review Maja! *bounces* Yes. I just bought this on audio Maja and your review has me excited. I hadn't heard of this but it sounds FANTASTIC! I'm definitely adding to the list! I always love Victorian settings, they're always so interesting! And I'm so in love with the cover. It's nice to see you has a great time and I confess I'm quite curious. thanks for the great review! Yes! I'm a fan of all those genres! :) This sounds so good and you really had me drooling at "deeply atmospheric"! Verra nice. I so need to read this one. Multiple POVs can sometimes be difficult to grasp, but from the tone of your review I gather that Fletcher is a beast with details. I don't read much Historical Urban Fantasy, so maybe I'll switch things up a bit and give The Oversight a whirl. Oh this sounds so good. I need a good new Historical UF, I am going to look this up. Thanks! Why "supra" instead of "super"? My brain thought it was a misspelling every time I read it! *waves it away* Whatever. I have this and NEED to read it! It sounds quite lovely. I had not heard about this one before and once you've said it's Urban Fantasy set in Victorian London?? I don't need anymore, adding it to my GR now and looking for it on my Kindle app!! I love those kinds of books. I can't wait to read it! I haven't read a book set in Victorian London in awhile and have been meaning to read this one! I've been hearing a lot of positive opinions towards this one and am glad yours aligns with the consensus, Maja. I can always count on you to tell it honest and, what's more, your taste in urban fantasy is impeccable. I definitely have to bump this up my TBR and dive into this world--it seems to be very much worth it. I do love the idea of it being set in Victorian England, and I have heard good things about this book. I am glad you enjoyed it so much and I'll be adding it to my wishlist.